Among the many things I love about Ash vs. 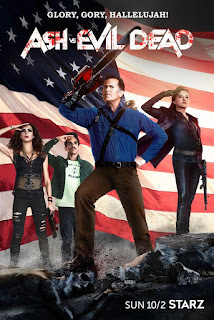 Evil Dead, the Starz television series continuation of the Evil Dead film franchise, is the fact that it acknowledges that our hero Ash Williams (Bruce Campbell) lost a sister during the events of the first film, 1981's The Evil Dead, which only he survived. Evil Dead II and Army of Darkness glossed over the deaths of Ash's sister Cheryl and their friends, instead just focusing on the death of his girlfriend. Now, finally, after two sequels and thirty years, the series admits that there were other lives lost that night, and since this second season of the show is set in Ash's home town, with Ash staying at his childhood home, there has been more focus on his family. And his late sister Cheryl. I thought it was a nice touch when Ash took a moment to look at the door to Cheryl's bedroom earlier in the season, but with 'Trapped Inside' director Mark Beesley (who previously worked with Evil Dead creator Sam Raimi on Hercules: The Legendary Journeys, Xena: Warrior Princess, and Spartacus: War of the Damned) and writer James E. Eagan (who wrote the season one episode 'Brujo') take the Cheryl referencing as far as possible. They actually bring Cheryl back. 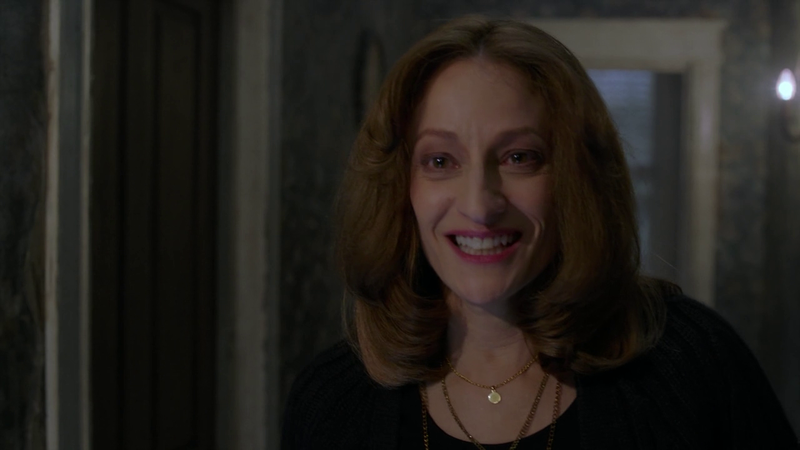 I had heard that actress Ellen Sandweiss would be reprising the role of Cheryl on the show, but I couldn't quite wrap my head around how that would work. Cheryl died more than thirty years ago. Sandweiss has aged well, but she has still aged since The Evil Dead was filmed in 1979, just as Bruce Campbell has - and they do point out the fact that Ash has changed since Cheryl last saw him, although he blames pancakes for the main change he has gone through. So how would the show explain Cheryl aging thirty years while dead? They get around that by not explaining it at all. And honestly, Ash vs. 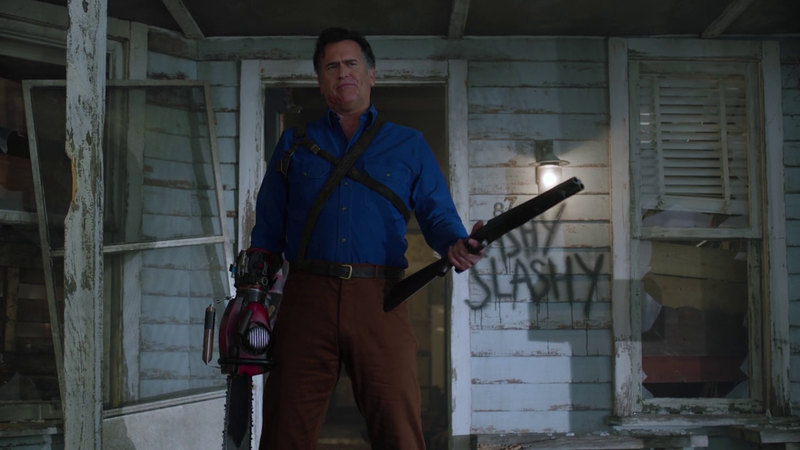 Evil Dead is such a goofy show, it doesn't even matter. If it does matter to you, maybe you can explain it away by saying the evil forces that has resurrected Cheryl have brought her back not as she was, but as she would be if she had lived - showing Ash what his sister would look like if she had still be in his life over the last thirty years. There, issue resolved. Regardless of all that fanboy waffling, it was incredible fun to see Sandweiss make a triumphant return, at first putting on the act that Cheryl has come back as her normal self, but within seconds letting loose her inner Deadite and proceeding to torment Ash and their childhood friend Chet Kaminsky (Ted Raimi) while they're trapped inside - the title did promise there would be some trapping inside of something, after all - the Williams family house. Ash and his cohorts Chet, Kelly (Dana DeLorenzo), Pablo (Ray Santiago), Ruby (Lucy Lawless), Linda (Michelle Hurd), and Lacey (Pepi Sonuga) can't leave the house because the place has been surrounded by a mob of angry locals, who have always considered Ash to be a serial killer because of the people who died around him in the films, not believing his stories of demons. The mob is being led by local Sheriff Thomas Emery (Stephen Lovatt), the husband of Ash's high school sweetheart Linda, now under the influence of the demon Baal (Joel Tobeck). Cheryl and Baal aren't the only evil forces that need to be battled in this episode. Poor Pablo is also being taken over by the power of the Book of the Dead, he and the book are merging as one, and Ruby - who is actually one of the Dark Ones who wrote the book long ago - is trying her best to save him. It's a major bummer to see Pablo going through such a horrendous ordeal, and I miss watching him be able to act like his normal self. He's usually such a fun, amusing guy. There's nothing amusing about watching him writhe and scream in pain while passages from the book appear on his flesh. Luckily, Pablo's pain occurs in an episode that is made extremely entertaining by the return of Cheryl/Sandweiss, so it doesn't have much chance to drag down the proceedings. Hopefully Pablo will be feeling better next episode. While I wait to see what happens next, there's something I want to say to everyone who was involved with the decision to bring Cheryl and Ellen Sandweiss back for this episode: Thank you!